In SciChart you can apply one of our in-built Point Markers on line or scatter charts, such as SCIEllipsePointMarker (circle), SCITrianglePointMarker, SCISquarePointMarker and SCICrossPointMarker Point Marker. You can also create your own with our SCISpritePointMarker type! 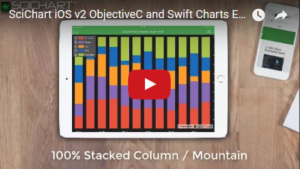 The Swift 4 and Objective-C source code for the iOS Chart with Point Markers example is included below (Scroll down! ).